Chiangmai Saloon is an American-styled burger and steakhouse with great South-western food, friendly owner and staff, nice atmosphere, music videos and live sporting events on a large screen. Why Chiangmai Saloon 1 is special ? 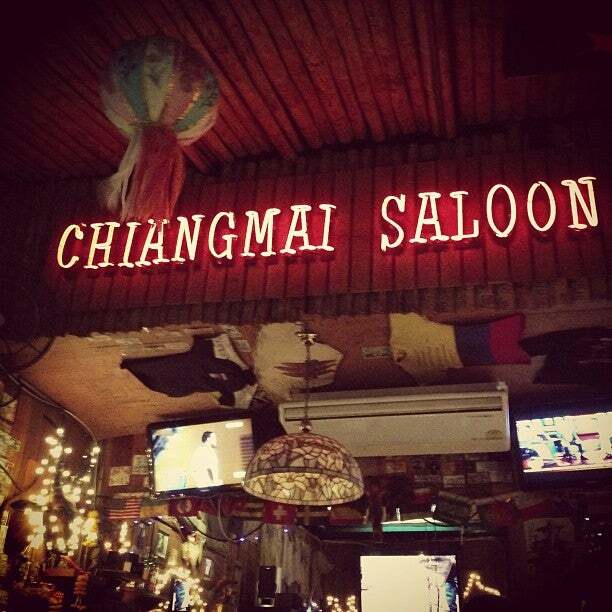 The Chiangmai Saloon is the ideal place in the city to have some fun along with some delicious western food. It is somewhat unique as compared to the other restaurants in Chiang Mai as it is decorated with rural wooden furniture, woodcarvings and other very interesting decorative pieces. These add to the charming ambience of dining. The menu of the saloon is quite interesting and offers a wide range of dishes to the guests. The list includes many delectable dishes ranging from appetizers to sandwiches, burgers and chicken dishes. Some of the popular dishes of the saloon are Buffalo wings, saloon sampler, saloon chips, calamari rings, baked potatoes, chicken fingers, bangers and mash, chicken fried steak, saloon cheeseburger and hamburger. You can also try the Mexican cuisine, which is considered to be the yummiest of all the dishes. How to get to Chiangmai Saloon 1? Grab a tuk-tuk or sawng tao, hop on a bicycle or motorbike to get to the Chiangmai Saloon Bar. It's located on Loi Kroh Road (150m from Night Bazaar). There's another branch of this bar which is located on Ratchawithi Road (inside the moat). They have to TV’s and will put on almost anything they have for you and there is also a pool table in the back. Upon sitting down you will notice a bucket of peanut and an empty bucket. They are an addictive but free snack on the table for all to eat and make a terrible mess with. Place is owned by a fellow originally from Texas. Ate there twice. I have a sensitive travel stomach and if anyone on the trip is going to get sick it will be me, but each time I ate there I did not have a problem and even though the Thai food is quite excellent sometimes you just want beef and a lot of it. Burgers are excellent, also a great place for ice cream. Staff was friendly, seems like a lot of western people living in Chiang Mai or staying for extended periods gravitate to this establishment. Good view of the street and its energy but the place is somewhat small so it can fill up. Compared to Thailand this place has western prices for the large burgers about $8, but well worth it. One caveat, in the rest room there are "joke" pictures on the wall which my wife found VERY offensive and definitely not suitable for children. Great food, can't beat the 199b steak dinner. Good place to chill and have a beer without being pawed at by hookers.